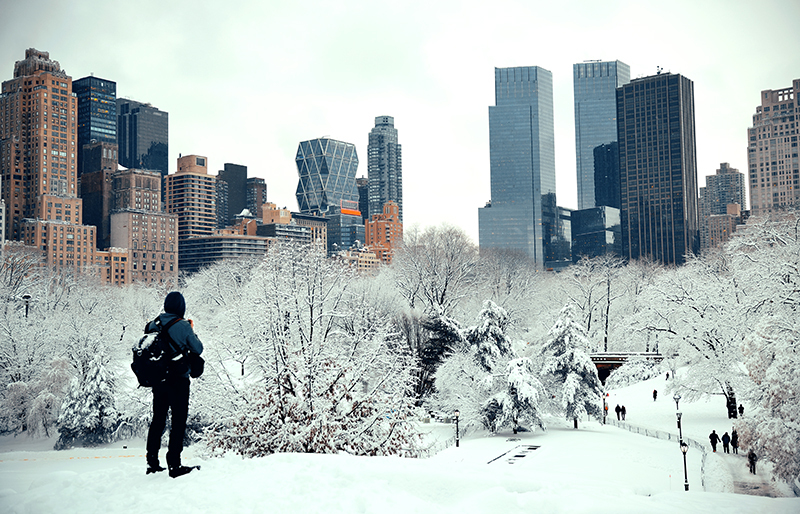 NEW YORK CITY, NY – Snow and an Arctic freeze are about to bring the winter blues back to New York City. The white stuff is set to start falling early Wednesday, with periods of heavy precipitation likely, according to the National Weather Service. And then the cold will return with a vengeance. Wednesday night will see a low of just 3 degrees, forecasters predict. The work week starts out Monday with sunny skies and a high of 33 degrees. Tuesday is likely to see rain in the afternoon that will continue until early Wednesday when the change over to snow is expected. An inch is forecast to accumulate by the time commuters start heading to work. Snow showers will continue until about 11 a.m. Thursday, with some heavy, the NWS said. And the cold will stretch through the week. Thursday is not likely to reach above 14 degrees. The good news? The nights are getting noticeably lighter. Spring is nearing. And at least we don’t live in Chicago where wind chill temperatures this week are expected to fall to an incredible 40 degrees below zero. The image below shows the odds of more than an inch of snow. Sunny, with a high near 33. Wind chill values between 20 and 25. North wind 6 to 9 mph. Partly cloudy, with a low around 26. East wind 3 to 6 mph. A slight chance of snow before 9am, then rain likely. Cloudy, with a high near 42. Wind chill values between 20 and 30. Southeast wind 7 to 13 mph. Chance of precipitation is 70%. Little or no snow accumulation expected. Rain before midnight, then snow likely. Low around 21. Wind chill values between 15 and 20. South wind 9 to 15 mph becoming west after midnight. Winds could gust as high as 26 mph. Chance of precipitation is 100%. New snow accumulation of around an inch possible. A chance of snow before 7am, then scattered snow showers after 11am. The snow could be heavy at times. Partly sunny, with a high near 24. Breezy, with a west wind 10 to 15 mph increasing to 17 to 22 mph in the afternoon. Winds could gust as high as 33 mph. Chance of precipitation is 30%. Mostly clear, with a low around 3. Breezy. Sunny and cold, with a high near 14.